The dream of a united Europe is one I share. Hell, I’d extend it further… a world without borders would be a glorious thing. Imagine there’s no countries. But sadly that original European dream, first envisioned after two world wars had ravaged the continent, has been hijacked by financial institutions and the forces of the free market. It has become simply a mechanism by which the rich and powerful use the sweat and blood of the masses to lubricate the machinery of capitalism and further entrench their wealth and power. Some have said that it was ever thus. That the European dream was always just a way for the few to prosper at the expense of the many. But I don’t believe that. The remnants of my erstwhile idealism still provide enough of a reminder that sometimes we people do things for the right reasons. That it’s not always craven and manipulative self-interest that drives us. But who today can still place their faith in the European dream? As our governments collude with private capital to heap unearned debt onto the shoulders of the masses, who can now believe that this once great project still has The People at heart? Which is why I do not lament the first fractures appearing in our continental unity. The past few days have heard furious denials from Athens that the Greek government is considering withdrawing from the single currency. Our political classes don’t seem to realise that we have become familiar with the pattern… first the denials (that there’s a problem, that the banks are in trouble, that we need an IMF bailout) and then the reluctant embrace of that which was denied. The Greeks deny any such idea is being considered or has been discussed. Others suggest that it has been discussed but that it’s merely a negotiating ploy to put pressure on the IMF and ECB to soften the terms of the bail-out. Either way, it’s causing problems for the single currency and we’re hearing rumours of frantic secret talks aimed at holding the Euro Zone together. I know people who will gleefully cry “I told you so!” And hey, let them have their whoop. Those who predicted the single currency would fail look like being right. Though the sad thing is… it wasn’t inevitable. Just as with the European dream as a whole, I kind of like the single currency idea. I think it would work better in tandem with ultra-local currencies built on a date-limited model, just as I think government works best as a combination of the ultra-local and supranational with little need for the middle tier. 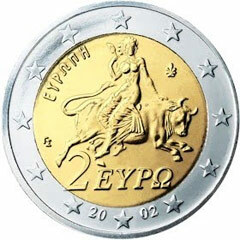 But sadly, although it was not inevitable, it looks as though we are fast approaching the fragmentation of the euro. I imagine it will be retained by a smaller “inner circle” of nations, but those of us on the periphery (Greece, Portugal and Ireland to start with) will find ourselves forced to withdraw unless an agreement to write-off the vast majority of our debt is reached. And while that’s still a possibility, I’m not holding my breath. Put simply, the repayment of our debt (especially when you chuck in the massive bank debts run up here in Ireland that have been immorally thrust onto the public) will be impossible without massive economic growth, akin to that experienced in the late nineties / early noughties. And that’s not coming back. In fact, we are entering a period of long-term economic contraction which will be caused by resource depletion. By 2015 (and probably a lot sooner) economic growth in Portugal, Greece and Ireland will be at an end for the foreseeable future. The only possible way to repay our debt at that point will be to withdraw from the single currency and rapidly devalue our local currency. This need not lead to massive social problems in itself (if done right) though the root cause of the trouble – resource depletion (particularly but not limited to peak oil) – inevitably will. I still see Ireland as a better place to weather the coming storm than most other places… but only if we grasp the bull by the horns and begin a massive peak oil mitigation strategy in the near future. Our current government don’t possess the vision or the competence to journey that particular road, but I don’t expect them to last the full term. We may have another roll of the dice sooner than we think. One response to "On hearing the news from Greece"
Good luck with the last part – I agree about Ireland being better placed to transition away from oil dependence than many other places. If only there was a decent Green Party! the remnants of my erstwhile idealism still provide enough of a reminder that sometimes we people do things for the right reasons.